We, the Tin Lizzies unit of Southwest Colorado, were convinced to bring some news of our unit to the Dust. We have been very negligent about providing information but feel it is important to let everyone know of the activities here on the west slope from Durango, Pagosa Springs, Bayfield, Ignacio, and Silverton. Our Tin Lizzie unit is composed of 13 cars and 15 members. We have a custom made trailer with two levels that holds 16 cars. We are in need of 3 more cars. Since the manufacture no longer makes this model, would everyone please keep an eye out for more cars? Also, the unit just purchased a pickup this fall to tow our trailer. We are working on art work designs for the truck to make the whole thing look like a matched set. 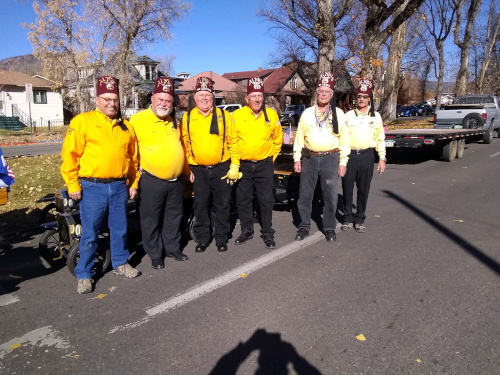 Our parade schedule takes us to towns all over the west slope, but we try to attend as many parades as possible and even some in New Mexico. On the 4th of July, we participate in three parades. One in Bayfield, Silverton and Durango. The parades in New Mexico are in Farmington and Aztec for the Connie Mack Baseball Series. Other parades include most of the local summer fests and we have been a regular participant in the Durango Veterans Day Parade. This is a very proud day for us as we have several members who are veterans and the community looks forward to our participation. In December we elected officers. I am the 2007 president; Don Anderson is the vice-president, and secretary/treasure is Ace Hall. We are looking forward to a full year of parades and fun. Sunday Feb. 18th we were pleased to have Ill Sir Dave Stevens and entourage drop in for a luncheon and a bit of news from his new Divan. They were on the way home from the official visit to the Montezuma Shrine Club, in Cortez.